This switch is in good working and good cosmetic condition. 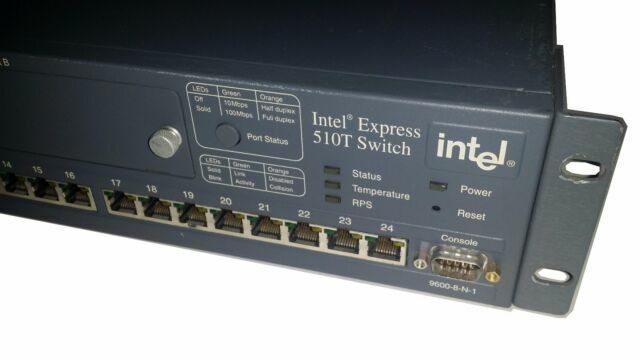 Intel Express 510T Switch is the scalable switch for affordable workgroup switching down to the desktop. This 24-port switch expands up to 32 ports with optional modules and up to 196 ports in a stack of seven. The Scalable Stacking Technology from Intel enables many of the advantages of chassis-based switches to be integrated into Intel Express 500 Series Switches, at a decreased up-front cost.Stack up to 7 switches with a resilient high-performance backplane that scales up to 14.7Gbps. For every switch you add to a stack, Scalable Stacking Technology provides an additional 2.1Gbps of bandwidth to the backplane. You can add switches as needed to add more users, knowing that your switching fabric will scale to increasing traffic demands. An entire stack can be managed as a single device. A redundant set of stacking modules can be used to eliminate a single point of failure for switch-to-switch connections.